Cisco-Eagle is employee owned, managed and operated. We believe that this gives us advantages over just about any company that we compete against – you deal with an owner with a real stake in the company every time you call us, every time you have your conveyor serviced, every time we install equipment, send an invoice, or design a material handling system. It’s a way of doing business that has permeated our company culture and helps us to be more accountable, more service oriented and more involved with our customers. Griffin is Cisco-Eagle’s Systems & Design Manager and has been with us since 1995. Darrell has been involved as a member of our ESOP Advisory Committee, and as an active participant in many employee activities. The award recognizes one employee every year for going above and beyond what is expected to promote our ownership culture and personal accountability. Last year, the award was won by our Training Manager, Anne Miller. 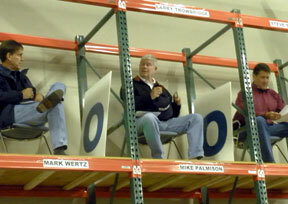 We ran a game show on Employee Ownership day, our own version of “ESOP Squares.” Since we are a material handling company, we naturally put our “celebrities” in a frame of pallet rack to run our game, which was held at our Dallas warehouse and broadcast to all other locations following a company wide brunch. Fashioned after the Hollywood Squares TV show, our Senior Leadership team and our Selling Shareholders manned the rack as the “celebrities” to fill in the squares. Cisco-Eagle has 8 office locations, which were split up into 4 different regions to play the game. Each region decided on a team of three that would be the contestants. They worked together to pick squares and “agree” or “disagree” with the ESOP celebrities. The game was played out in three rounds with a lot of humorous moments intertwined with the ESOP information. In the end, our South Texas team was victorious and took home the illustrious ESOP Squares trophy, as well as scoring an ice cream party. Many examples of our print advertising can be found at our literature downloads area. The AACE awards are presented annually. More information can be found here.